Helical piers were originally developed to structurally support offshore foundations (lighthouses) and developed over time for inland use. Helical piers can be used on both new and old construction for foundation support. 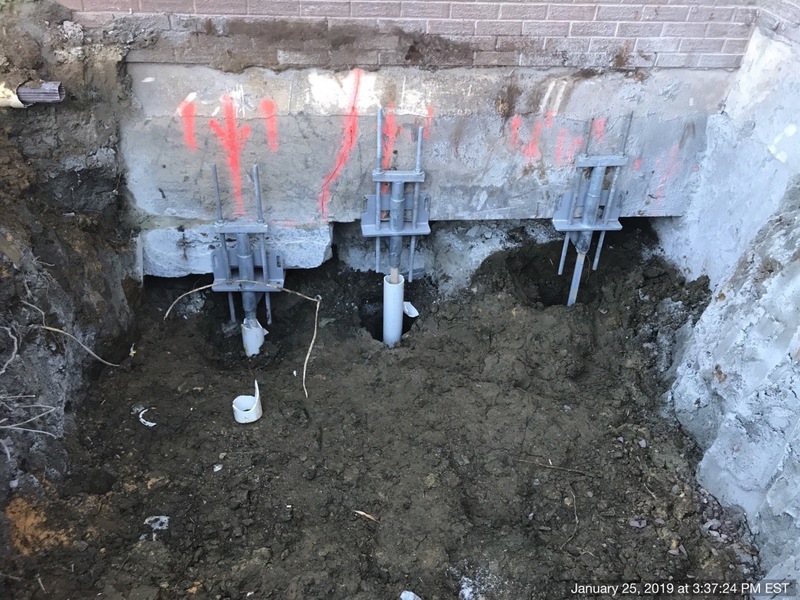 On new construction, helical piers can be installed to provide a solid base for foundations, where soils may not naturally be able to support the weight load of a proposed building or home. 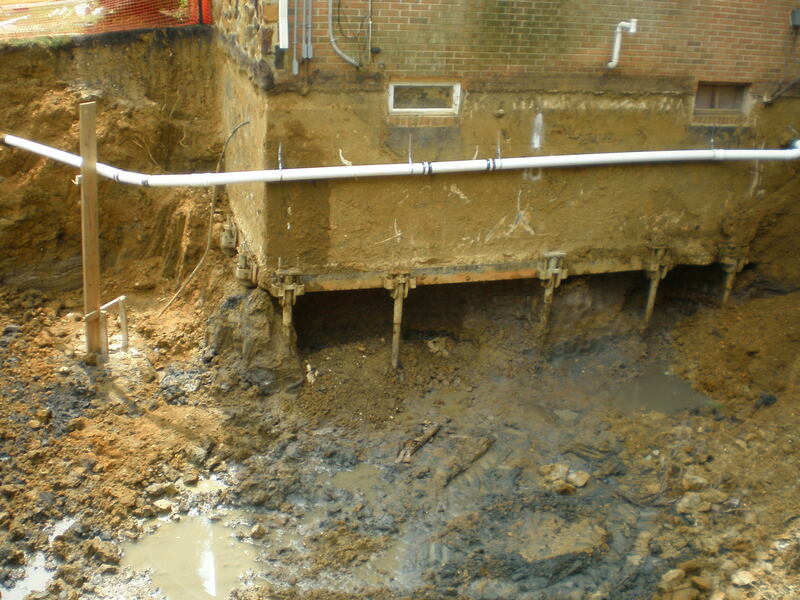 On existing construction, helical piers can be used to shore up foundations where cracking and settlement has occurred. Helical piers are commonly used in shore communities where existing pilings are failing. Helical piers are used in the environmental field for structural support of foundations, utilities and slabs to allow the direct source removal (remediation by excavation) of petroleum contaminated soils. Installation equiment is low impact and can easily access hard to reach areas where larger pile driven and excavation equipment cannot. 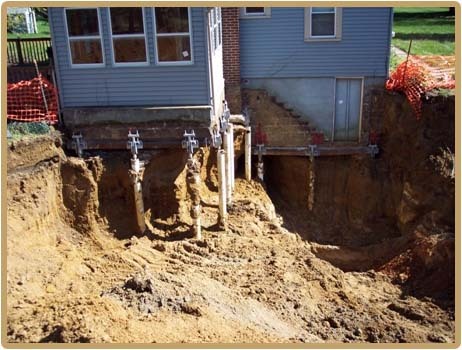 helical piers are advanced (drilled) to what ever depth is required to find a solid base for the foundation. Piers can be drilled to 8' or 80', which far exceeds depths of both excavation and pile driven equipment. Pier installation is quick, with multiple piers being able to be installed in a given day. Structural steel can be added to existing foundations to add additional strength to foundations. To provide true turnkey solutions, Curren Environmental Inc. is a certified CHANCE Helical Pier installation helical pier contractor. By providing this aspect with in house equipment and personnel, Curren Environmental has eliminated the reliance on subcontractors. Our "in house" remediation and Helical pier crews allow Curren to reduce the down time and "cost plus" that sub-contractors often create. 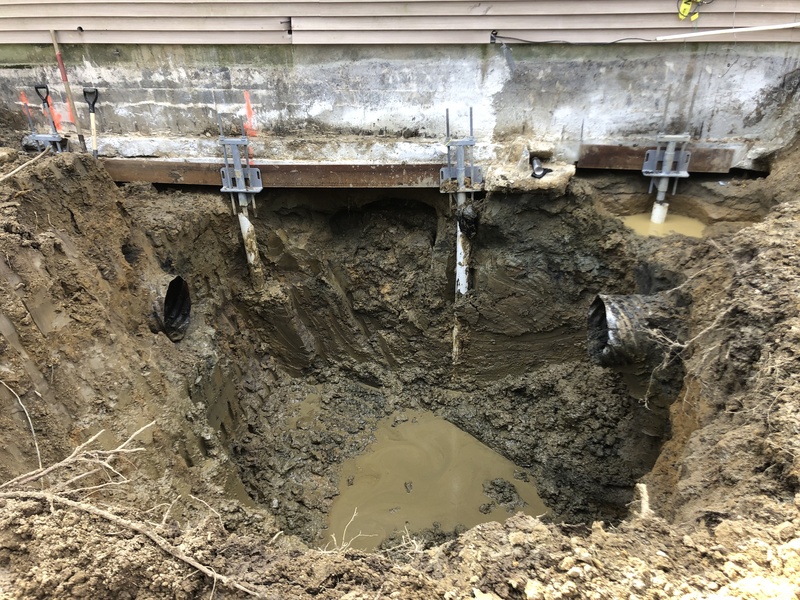 Our crews can flow seamlessly on a daily basis from remedial excavation to structural support, to maximize site time and reduce overall project duration and associated cost. Curren Environmental will have an independent structural engineer develop a support plan for the structure and the drafted plans will be submitted to the municipality for approval. (Curren Environmental will handle all local permits that are required for Helical Pier installation as well as obtained engineered drawings for structural support). Once our helical pier mobilizes to a site, Curren personnel will expose the foundation to be supported. If contaminated soils are encountered, a Curren environmental project manager will direct the excavation and segregation of clean and petroleum impacted soils, to prevent mixing of clean and contaminated soils. 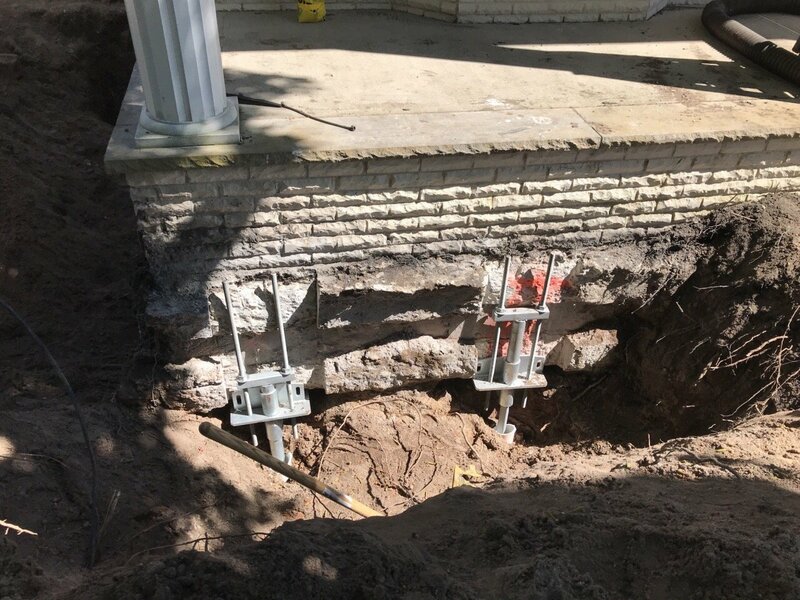 Once the foundation is exposed but not structurally undermined, a bore hole will be advanced at each anchor location wide enough and deep enough to place a bracket under the foundation. The leading section of the anchor with the proper number and size of helices will be installed by a hydraulic driven excavator. Extensions are added until the helices are at the proper depth and the predetermined torque is achieved. 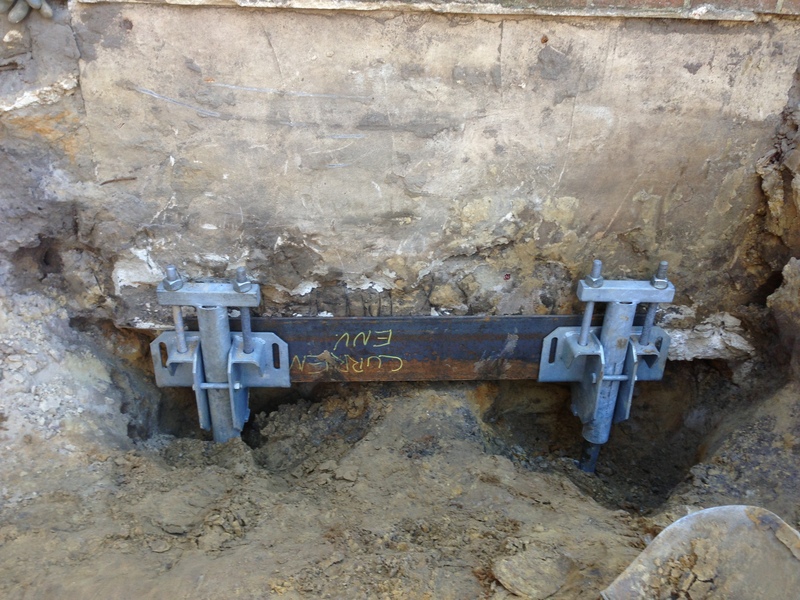 At that point the bracket is added, the load is transferred to the anchor, and the building can be stabilized and the remediation project can continue. IDEAL® piles are segmented, extendable shafts ranging in size and capacity. Round shaft pipe piles have a larger section modulus than square shaft helical piers with a sleeved, two- or three-bolt connection. They are a solid choice in loose soils, mitigating lateral or buckling concerns. IDEAL® Group manufactures an extensive selection of round shaft and round corner square shaft helical piles and anchors. All products come bare or as galvanized steel. Square shaft helicals are round-cornered, extendable solid steel bars ranging in size and capacity. Most square shaft helical piles are available in sections of 3, 5, 7, and 10 feet long. Square shaft helical anchors are the best choice for many tension applications and some compression applications such as sand, hard soil layers, and trash sites. Helical piers do not cause vibration during installation. Helical piers can achieve design loads in given soils. 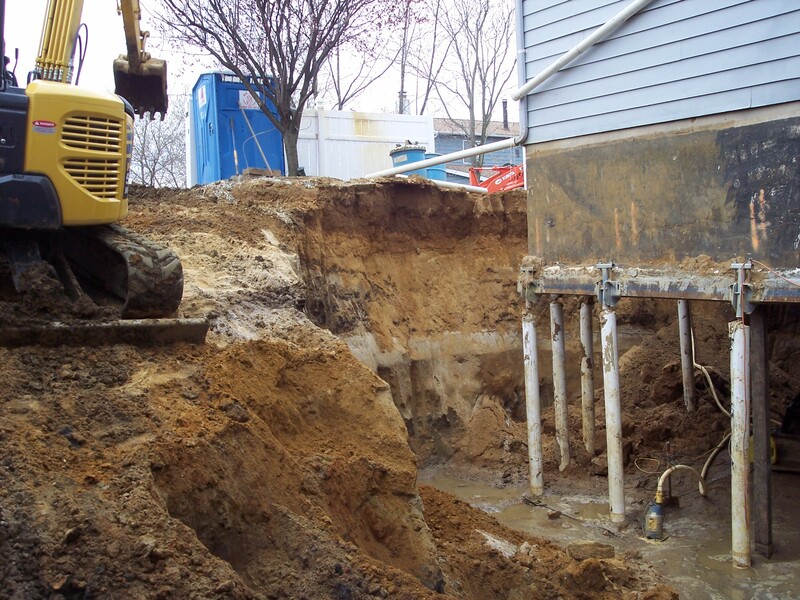 Helical pier installation do not create excavation spoils that would require removal. Low mobilization costs for helical pier installation equipment. Environmentally friendly small installation equipment has minimal site impact. 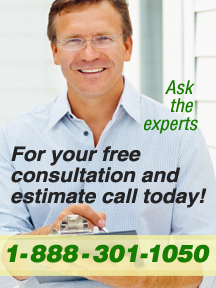 Installation can be completed in all weather conditions. Installs in limited access situation – hand-installation can be performed with portable equipment. Helical piers have the ability to be installed in close proximity to underground services. Capacity of each pile is accurately measured using installation torque. Helical piers can be used for support in a temporary situation such as pre-construction support.